Snapchat has launched a feature that enables up to 16 people to take part in a live chat together, using either video or just their voices. The app's members can also start tagging each other by username, using the @ symbol in their posts. The changes will roll out over the coming weeks, the firm said. Snapchat came under fire for a recent redesign. A petition calling for the changes to be reversed attracted more than 1.2 million signatures. At the weekend, Snapchat's first TV advert aired in the US. Observers noted that it seemed to strike a family-friendly chord. 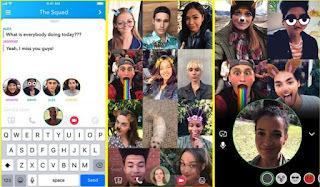 "Snapchat's early growth has been largely been built on attracting a strong youth-centric audience," commented Jack Kent from IHS Markit consultancy. "To grow its user numbers it needs to broaden its appeal to a wider audience. "The key challenge... is how to add older users without losing the cool factor that helped fuel its early growth." However, news site The Verge claimed the ad had misfired. "Snapchat is the place where you trade dumb jokes with your friends, non-essential thoughts, or show off the trashy nights you don't want preserved past a five-second timer," wrote Megan Farokhmanesh. "Its feeble attempts to win over everyone either misunderstands its own product at its core, or signals a desire to re-frame that product as a second-string replacement for platforms that already exist." Snapchat and its parent company Snap have faced criticism in recent weeks. In February 2018, $1.3bn (£1bn) was wiped off Snap's stock market value after reality TV star Kylie Jenner tweeted that she no longer used the service. And Snap had to apologise after an ad appeared on its platform for a third-party game that asked users if they would "rather slap Rihanna or punch Chris Brown". Chris Brown was convicted of assaulting the singer in 2009. Police opened fire outside Ukraine’s embassy in London on Saturday after a vehicle rammed into the ambassador’s parked car and then drove at officers called to the scene. In addition to a growing lineup of scripted fare, documentaries will be another key focus for Apple TV+, the company’s new streaming service set to launch in May. According to a new report today from Variety, Apple has hired A&E’s Molly Thompson as its head of Documentaries. The leader of Sudan's interim military council has vowed to "uproot the regime" two days after a military coup. Speaking on TV, Lt-Gen Abdel Fattah Abdelrahman Burhan announced the restructuring of state institutions, the end of a night curfew and the release of political prisoners.